worked as a graphics designer for more than 30 years in Chicago and Winston-Salem, North Carolina. In 1994, Jim and his wife, Pat, moved to the Carolina Mountains to pursue his life-long desire to work as a professional craft artist. In the early 1990s, Jim had experimented with a variation on the wood-art style often called segmented or laminated turning. He decide to expand on the concept as he moved from hobbyist to professional. He dubbed the technique “layered bowls”. Over the ensuing years, he has developed many variations on his layered bowl concept. Jim also decided to limit the size of his bowls to less than five inches in diameter to make his them available to a wider audience. He has shown his work in New York, Los Angeles and Chicago, as well as many galleries throughout the Southern Appalachian range. In 2000, Jim was juried into the prestigious Southern Highland Craft Guild, America’s second oldest craft guild. 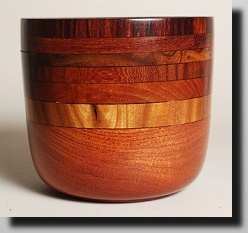 In 2004, three of Jim’s bowls were juried into Lark Books' collection, 500 Wood Bowls. 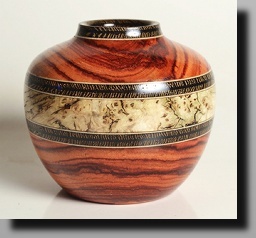 In 2005, Jim was invited to demonstrate at the Utah Woodturning Symposium, America’s oldest symposium. Later the same year, he was asked to write the cover article for the winter edition of the journal of the American Association of Woodturners, American Woodturner. In 2007, Jim and his work were featured on the popular UNC-TV / PBS series, Our State. In 2010, five of Jim’s pieces were part of North Carolina State University's Gregg Museum’s exhibition, “With Lathe and Chisel: North Carolina Wood Turners and Carvers”. In 2012, an assembly called "Funny Side Up" was included in Grovewood Gallery's show titled "LOL: Handmade and hilarious." In 2013, three of Jim's pieces were included in the show titled, "Branching Out: Grovewood Turns to Wood", featuring wood sculptures by 17 accomplished artists. Jim McPhail . . . Early layered bowl, seven layers, four inch diameter, 1993. Signature layered bowl, sixteen layers, 3-1/2 inch diameter, 2014. Watching the layers being revealed as the inside of the bowl is turned.